These are not the most glamorous looking muffins by any stretch of the imagination. They don't have any fancy fruit inside, or even chocolate chips, but that shouldn't stop you from making them. These plain looking muffins are hearty and delicious, full of good-for-you oatmeal and spiced just right. 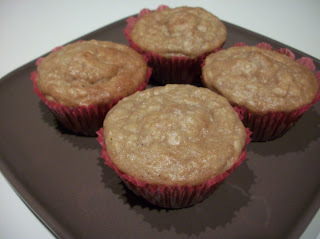 Some muffins are just an excuse to eat cake for breakfast (and don't get me wrong, I love those!) but these are more on the healthy side - loaded with that good oatmeal, you will be ready to face the day and won't have a sugar crash! This recipe makes two dozen muffins. Whatever you can't eat in a few days, stash in the freezer, and you'll have a healthy breakfast whenever you need it. Find more great ideas at Wow Us, What's Cooking, Showcase Your Talent, Full Plate. In a batter bowl or large measuring cup, stir together oats and buttermilk. Allow to sit at room temperature for 30 minutes to 1 hour. In a medium bowl, whisk together flour, baking powder, baking soda, salt, cinnamon, and nutmeg; set aside. After oats have finished soaking, stir in brown sugar and eggs. Mix in oil, yogurt and vanilla, and then stir in flour mixture until just combined. Evenly divide batter among 24 greased or paper lined muffin cups. Bake at 400 for 20 to 25 muffins or until tops of muffins are golden brown and toothpick inserted into center of muffin comes out clean. Cool muffins in pan for a few minutes before turning out onto a cooling rack to finish cooling completely. Your Muffins look delicious Sara. Thanks so much for sharing with us at Full Plate Thursday this week. Hope you are having a great day and come back soon!